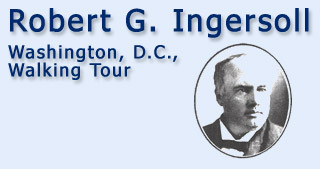 If you have a suggestion concerning the Robert G. Ingersoll Washington, D.C., Walking Tour, please use the form below. Guided group tours are available on a limited basis. For updated information on guided tours, events, and resources, visit our blog. Special characters and web addresses prohibited; 400 characters maximum.